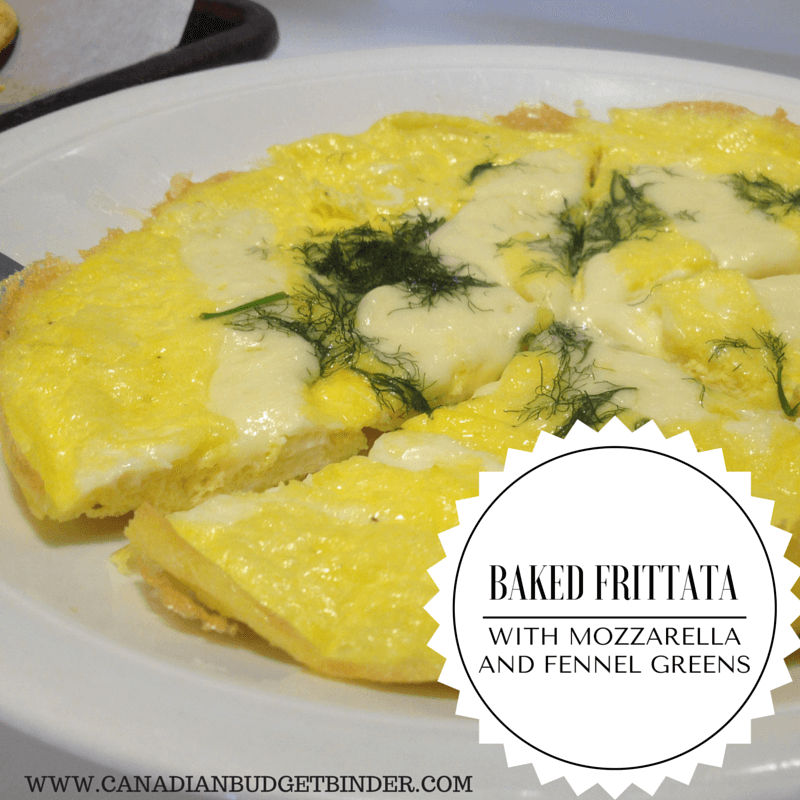 Ever since my wife started making changes to her diet to incorporate the low-carb methodology we’ve been working on new recipes like this baked frittata with mozzarella and fennel greens also known as fennel fronds. If you have never tried fennel before you must dive in and spend the few dollars to buy one. Fennel is crunchy like celery but has an anise flavour too it that is gorgeous to eat raw, in salads or you can roast, grill and saute it. For this baked frittata recipe I only used the fennel greens as opposed to just the fennel bulb since most people don’t know what to use the fronds for and toss them in the garbage. You can use the fennel fronds to infuse water to make a healthy tea, fennel infused oil, stuffed in fish or to make a lovely soup stock. The sky really is the limit if you love the flavour of fennel fronds when cooking and adding it to your favourite recipes. When I use the fennel bulb I chop the tough stems like cabbage after I slice the fennel in half and remove the stalk and fronds. I rinse each layer of the fennel one by one tearing it apart. Once dry you can slice it, chop it, Julienne or even shave it which looks simply amazing on any dish. Most often I chop up the fronds and stalk then add them to a recipe as I would a fresh herb such as parsley, basil etc. If I have any fennel fronds leftover I will put them in a freezer bag and use them for stock or I add them to recipes as I need it. You can even store the greens in the refrigerator for up to a week and use as needed. Another favourite way to use the greens is to blitz them in the food processor with butter, wrap in plastic, refrigerate then slice as needed to have a lovely fennel fronds butter. I’ve learned not to waste anything in the kitchen if I can because food waste in Canada is a huge problem that needs to be recognized by more people. Lastly, I like to use the greens as a garnish or just sprinkled on top of a meal like I have with this baked frittata recipe today. The key to making a successful baked frittata in my opinion is to cook it low and slow. I start the frittata on the stove-top then finish it in the oven. You will notice your baked frittata rise like a cake would but it will deflate after you pull it from the oven and it cools. When I pre-heat the oven I’ll have it set at 250 degrees and let the baked frittata cook for about 10-15 minutes until golden and then add fresh mozzarella and fennel greens on top for flavour. If you’re hosting a brunch this is a gorgeous presentation especially during the summer. There is something about the fennel garnish that makes this dish seem richer than you think. What I like is a thick slice of frittata that can be used as part of a meal or inside of a sandwich. My wife and I make baked frittata and put it inside between low-carb oppsie rolls for breakfast which are delicious and easy to make. If you have a cast iron pan now is the time to use it otherwise you can make this oven frittata on the stove-top exclusively using a frying pan cover. If you’re like us and have an oven safe frying pan or a deep dish pie dish you can still make baked frittata in the oven. What to serve with frittata? You can add a side of pork and beans, a garden salad, tangy Cole-slaw, raw vegetable slices, bacon, sausages, ham or soup. You can even serve on top of last weeks blog recipe from Nicola, potato waffles. Whatever you’d like to have a side would likely work as this is such a basic frittata recipe which is versatile. Eggs are delicious any time of day. This basic frittata recipe can be modified to add more ingredients or kept simple as I've done today. A perfect addition to any breakfast, lunch, dinner or brunch. In a mixing bowl crack eggs, add whipping cream, salt and pepper then mix vigorously for about a minute. You can also use a stand or hand mixer if needed. I hope you enjoy this basic baked frittata recipe and remember that eggs aren’t just for breakfast. Share this recipe with your friends if you think they might like it and please leave a review and tell me what you think. Looks yummy!! Not big on fennel but as this is such a basic recipe,(the best kind to fudge with!!) I can see lots of possibilites here. I would double it here for the 4 of us but I gave a big cast iron fry pan as well as a slightly smaller one to use. I think my Paderno non stick can handle that temperature in the oven as well. I see a sneaky way to clear up veggie leftovers!!! Well that’s just it. So many people struggle to make a frittata or omelet I thought this was a perfect basic recipe to share.